About 50 volunteers fan out around Madras May 5, to install smoke alarms in local residences. The American Red Cross, firefighters and volunteers fanned out around Madras on Saturday, to make sure that local homes are protected with smoke detectors. 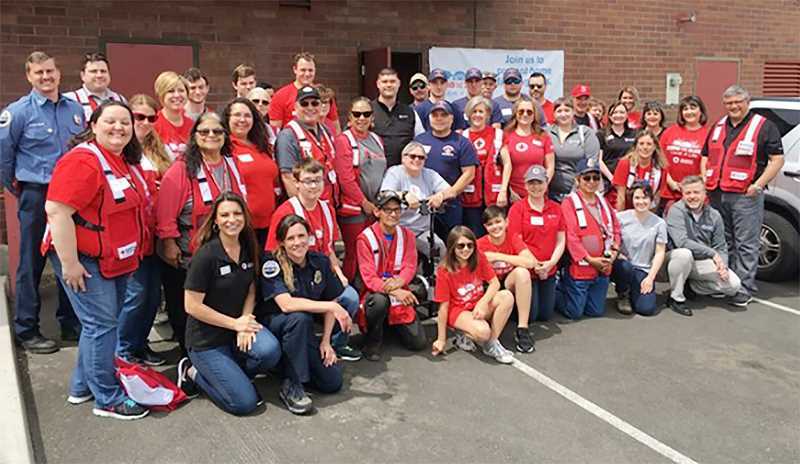 As part of the "Sound the Alarm" initiative, started by the Red Cross in 2014, more than 50 volunteers divided up into 12 teams to install nearly 300 free smoke alarms in local homes. 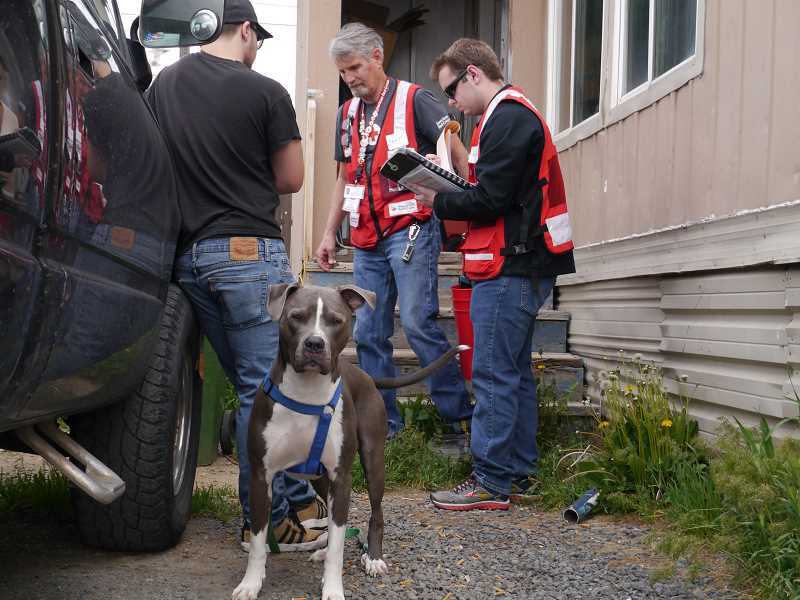 Volunteers concentrated on at-risk neighborhoods, installed alarms, replaced batteries in existing alarms, and provided fire prevention and safety information, such as how to plan an escape route. "We located homes in need of smoke alarms based on information about high incidences of home fires from the Jefferson County Fire District No. 1," said Monique Dugaw, regional director of communications for the Red Cross, who participated in the Madras event. "Residents were extremely grateful for the free service and welcomed volunteers into their homes." Prior to Saturday, Red Cross volunteers visited with local residents and had more than 65 appointments set up, said Capt. Kasey Skaar, of the Jefferson County Fire Department, which had seven volunteers participating. "If they had wired smoke alarms, we just added new ones in bedrooms and other rooms," said Skaar. "We found places that had not working fire alarms, or the batteries disconnected from the smoke alarm, and some that didn't have them at all." Before heading out to install the smoke detectors, Red Cross regional CEO Candace Horter, Red Cross Central and Eastern Oregon Executive Director Shon Keely, and fire recruitment and retention officer Capt. Kasey Skaar, of the Jefferson County Fire District, all spoke on the importance of the team effort. Besides talking about the partnership between the organizations, Skaar emphasized the importance of having fire escape plans, with two exits out of a home, and making sure all members of the household are aware of the plans. "I encouraged all the teams to talk about it," said Skaar, adding that some local neighborhoods back up to areas that could be subject to wildland fires. Using the "ready, set, go" evacuation levels, he suggested that residents need to be prepared "if we have to evacuate." 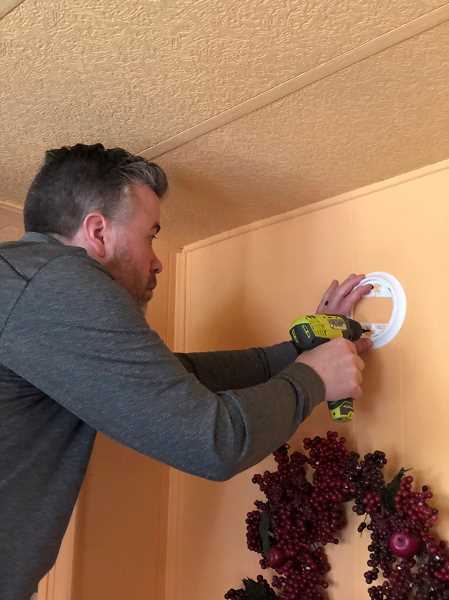 The teams spent about seven hours installing the smoke detectors, finishing up by 4 p.m.
"It was a really great experience on the fire department's side, working with them," said Skaar. "With a team like that, you can definitely push through and put up a lot of fire alarms." Although the Red Cross' goal was to put in 300, said Skaar, "For us, in our fire district, going from having zero the day before, to about 300 — how great is that for our community. A big thanks to Red Cross for the partnership." "The Red Cross responds to nearly 64,000 disasters a year, the majority of which are home fires," said Dugaw. "Working smoke alarms in a home cut the risk of death by half, and having an escape plan further improves the odds of survival." "Across the country, the Red Cross efforts to end home fires are making a difference. As of April 2018, the Red Cross and our partners have saved 416 lives and installed more than 1,103,000 free smoke alarms," she said.